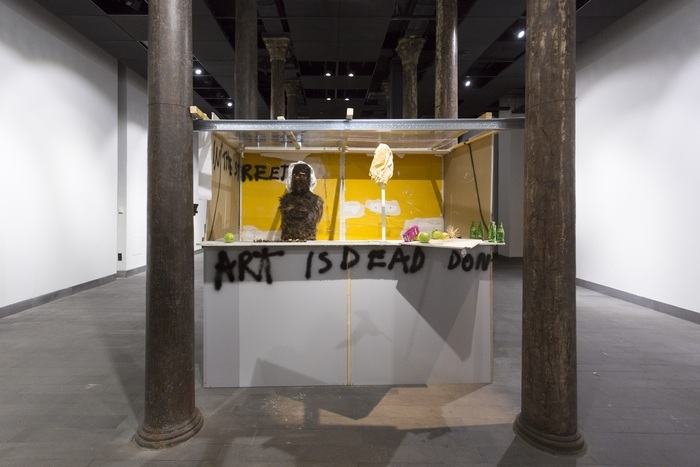 To paraphrase Augusto Boal, art may not be the revolution but it is the rehearsal; in the case of the 13th Istanbul Biennial, however, the revolution arrived before the rehearsal. The Biennial’s focus, “the notion of the public domain as a political forum”, was announced in January, before the city it meant to take as both site and subject found more urgent occupiers with higher stakes. Fulya Erdemci who has curated past Biennials intended this year's “Mom, am I a Barbarian?” as a departure through the planned use of sites dispersed throughout the sprawling city in the midst of its rapid, often unjust, and highly contested transformation. It was a prescient focus; in May, protests erupted throughout the city originating over the municipality's planned demolition of Gezi Park and plans to rebuild the Ottoman Military Barracks that once stood on the same ground, to house an extensive shopping mall, one of so many luxury shopping complexes recently erected in the city at the expense of many neighborhoods. The occupation of the park by protesters began as an attempt to halt the initiation of one project; but with Prime Minister Tayyip Erdoğan’s vilification of the protesters and the violent reaction from the police that filled the city with teargas and took the lives of six protestors to date, the occupation and the protests that still continue have become a battle for and celebration of the very possibility of publicness in the life of the city. 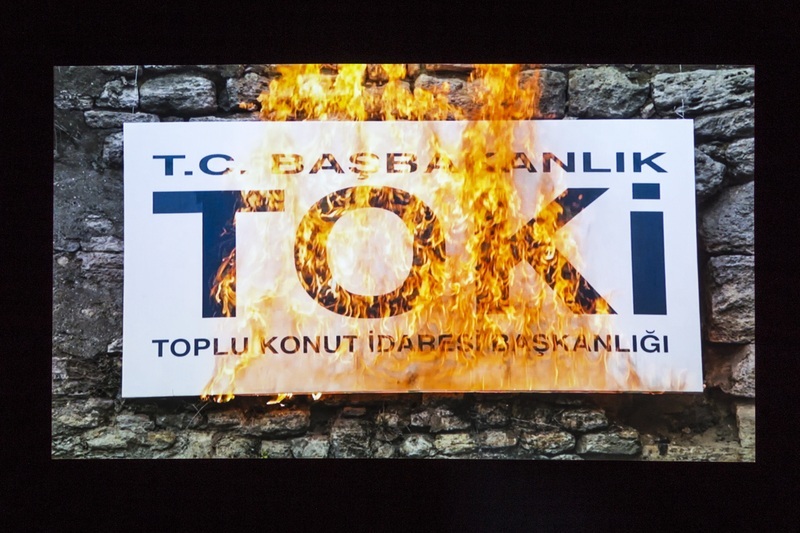 Stating that it would be inappropriate to seek official permissions for the originally planned sites, including Gezi Park and Taksim, from the same AKP government who fatally denied protesters their civic use of the same spaces, Erdemci moved the Biennial into the few spaces it now inhabits (Antrepo no. 3, Galata Greek Primary School, ARTER, 5533 and SALT Beyoğlu). In defending what has been called a voluntary “retreat” she added that by keeping the Biennial out of the streets she was keeping silent to allow visitors to the Biennial to hear the streets and those taking action in them speaking for themselves. Protests not only occupied the Biennial's intended locations but also prefigured some of the planned art interventions for those sites. During the occupation and following, protesters drew from visual, literary, performative arts strategies as well pop culture to rapidly produce structures, images, graffiti and performative actions, not as art for exhibition but rather as tactics of necessary immediate visual communications and lived culture. It is not difficult to sympathize with the curator’s and even some artist’s hesitance to utilize public spaces for exhibition. An exhibition can critique, educate and inspire, and yes, even rehearse political action in moments of calm but in the moment of political action – or perhaps, even more uncomfortably, immediately following – its function seems less clear and more than a little out of touch. Besides perhaps a deflated mimicry, what could have come from the installation of an artworld sanctioned library in Gezi Park as artistic gesture mere months after protesters had created one for themselves, eventually destroyed by the police? 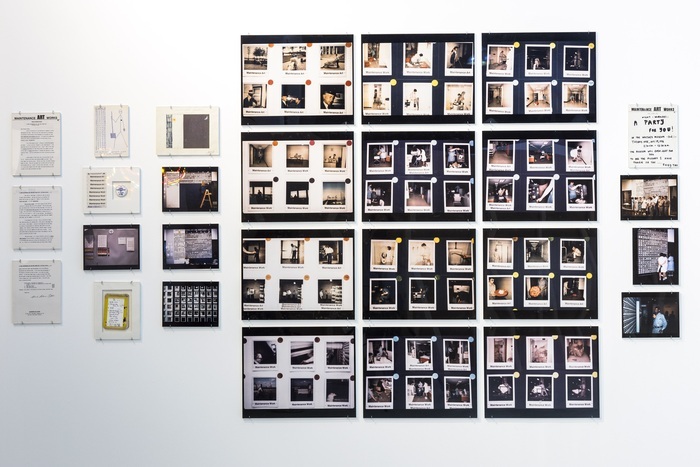 Mierle Laderman Ukeles, I Make Maintenance Art One Hour Every Day, 1976, colour photographs, drawing with collage, text pages, notebook, announcement, labels, button; courtesy the artist and Ronal Feldman Fine Arts, Photo: Servet Dilber. The retreat into the four walls of five locations within the city is not merely a retreat into internal space, but also into the controlled temporality that the gallery and museum are built for. Nowhere is this more evident than the Antrepo 3, one of a pair of large industrial buildings on the waterfront that have been used for a number of past Biennials. Antrepo 3, itself slated for demolition to make way for high rise construction, houses the majority of the eighty-eight artists included in the Biennial. Installed here, among a good deal more current work, is a kind of historic section focused on documentation of performative works that operated in the intersection of art and politics: including the Polish street theatre group Akademia Ruchu who worked across decades through shifting political regimes; New York based performance artist Mierle Laderman Ukeles; and Czech artist Jiří Kovanda’s street performances. The historic documents of these undoubtedly significant and salient works somehow seems to simultaneously intend to validate art as such in terms of politics and to contextualize or even historicize the current lived political moment even as it still continues in the streets. Even the neighboring installation, by Thomas Hirschhorn, usually aggressively active, is presented as a survey of documentations of past public works, Timeline: Work in Public Space, 2012. The work most demonstrative of the kind of aestheticization of recent events the exhibition’s restraint seems to be trying to avoid, is also its most visible. At Salt Beyoğlu – set on İstiklal Caddesi, (“Freedom Street”) the always crowded wide pedestrian street of cable cars, nightclubs and street vendors that has been frequently cleared in the past months by teargas and water cannons – a much maligned installation on the first floor is visible to the busy street through large windows like those of neighboring proliferating boutiques. Intended as a criticism of consumerism and growing economic precarity in Istanbul, Market or Die, Diego Bianchi’s sprawling assemblage of haphazard wooden and newspaper constructions, piles of water bottles, simit, and empty mussel shells and walls grafittied by both the artist and the exhibition goers, evokes nothing so much as the informal city within a city of the occupation of Gezi, but replete with art historical references and aesthetic gestures. The work is clearly intended to be less cynical than it seems – but, contrary to Erdemci’s concerns, the streets speak quite loudly and does more to frame the Biennial than the other way around. Diego Bianchi, Market or Die; Courtesy of the artist. Several of the most memorable works of the exhibition sit squarely within the moment and question the presumed distance of the exhibition from politics that even allows for the possibility of retreat. Hito Steyerl’s Is the Museum a Battlefield?, at the Antrepo 3, a stark and effective lecture/video, and the infographic Networks of Dispossession, on the roof of the Galata Greek Primary School, both address the relationship of the Biennial to the neo-liberalism that spurred recent protests. Steyerl traces the origin of a bullet casing from the execution and mass grave site of her friend, Kurdish Worker’s Party member Andrea Wolf back to the companies that produced it and Dispossession intricately and interactively maps the practices of dispossession and arguably illegal seizures of property by various corporations and international conglomerates and their relationships to one another and various cultural and media organizations around the country. In both cases threads lead back to companies who support the Biennial, pointing to the Biennial’s complicity and positing an alternate narrative for its withdrawal from public. The most immediately arresting work of the entire exhibition is Halil Altındere's video Harikalar Diyarı (Wonderland), a music video of a young rap group called Tahribad-ı isyan whose Sulukule neighborhood is under continued threat by the ever expanding TOKI development project. Young men shadow box bulldozers, run from the police, and torch a TOKI sign and a zabita with a thrown molotov cocktail, echoing images from the protests, despite being completed months beforehand. The music and the imagery is angry and righteous and infective, and performs a kind of Robin Hood intervention, taking the language of hip hop back from the culture of consumption and luxury goods it now symbolizes and delivering back to the kinds of political and economic battlegrounds it originated from. Altindere’s screening room is perpetually full of people on their second or third consecutive viewing. Despite its being a more difficult video to watch, the corner in which Steryerl’s Battlefield which depends on but a few gallery benches for seating is often rung with audience members standing through its thirty-five minutes. These works have become spaces of congregation in the often cavernous Antrepo. Erdemci thankfully made admission free of charge in a not insignificant nod toward publicness, but save the few coffee shops and the lovely roof of the Galata Greek Primary School building the Biennial lacks spaces that invite and allow for the kind of congregation so much of the often excellent work and recent events call for. It speaks equally to the strength of the work and the ingenuity and conscientiousness of some Biennial goers that these congregations occur – suggesting and recouping a little of the greatest lost potential of its focus, to not only present but engage “publicness” as more than a subject of interest, and in a more profound and lived sense than merely outside versus in.